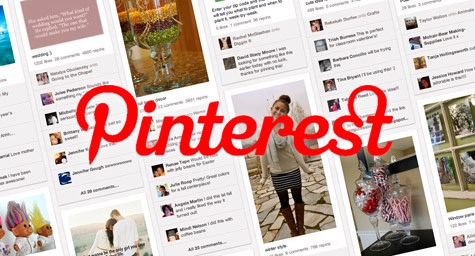 In 2011, Pinterest became an incredibly popular social networking site and maintains that momentum into 2012. The network allows people to create online pinboards featuring images that pique their interest and “pin” similar photos on other boards in a variety of categories. Users can follow each other and share their photos, while businesses can benefit by exposing their image content to a highly engaged, predominantly female audience. Mashable.com recently offered some tips to help brands take full advantage of the Pinterest phenomenon. 1. Express Your Brand’s Character – Pinterest offers an inspired way for brands to convey their mission and message through powerful images. This is especially useful for businesses that don’t sell tangible products, by providing a means for visually describing the brand’s personality to consumers. 2. Host Contests – All it takes is a creative concept, such as a “Most Creative Board” contest, featuring images that spotlight a particular brand. It’s a smart way for businesses to engage their customers, generate buzz, and display their products to the online community. 3. Get Feedback on New Products – The interactive and personal nature of the network makes it easy for brands to get real-time consumer reactions before launching a new product. 4. Create a Connection with Consumers – By including images and names of customers interacting with a brand’s product, businesses can strengthen their relationships with current customers while helping prospective customers see how products are being used and enjoyed. 5. Show Off the Company – Larger businesses with many departments can showcase their talented teams by pinning staff photos and accomplishments on individual pinboards. This can help acquaint consumers with the faces behind the brand while highlighting developments at the company. Pinterest holds enormous potential for brands to gain exposure and develop more personal relationships with consumers as the social network continues to attract the attention of today’s online audience. To learn more about innovative social networks and how they can benefit your business, contact MDG Advertising today at 561-338-7797 or visit mdgadvertising.com. MDG Advertising, an award-winning, full-service Florida advertising agency with offices in Boca Raton and New York, NY, specializes in developing targeted Internet marketing solutions, exceptional creative executions and solid branding and media buying strategies that give clients a competitive advantage. Our core capabilities include print advertising, branding, logo design, creative, digital marketing, media planning and buying, TV and radio advertising, customer relationship management, inbound marketing programs, public relations, Web design and development, email marketing, social media marketing, local search and SEO. View MDG Advertising’s creative marketing portfolio.